I’ve got a great new video for you, 10 Tips Every Quilter Should Know! Let me know in the comments if you think I left anything out! I can’t tell you how many times sewers and quilters come to me with tension issues, thread breaking and bunching, machine making weird noises etc … and many of those issues have been solved by changing out the needle. When the needle gets dull, it doesn’t pierce through the fabric like it should, cause problems. I recommend changing your needle for every project. I am not partial to a specific brand, I have used many of them and they all seem fine to me! Note: A topsitch needle is often recommended, that just means that the eye of the needle is a little bit larger allowing for the thread to wiggle around a bit more. This is often recommended for machine quilting. For most piecing and quilting needs, an 80/12 needle is best and a 90/14 needle is ok too. Many newer quilters are very unsure of what size, so I usually recommend an 80/12. 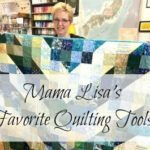 There are lots of great thread for piecing your quilt and even more options for quilting your quilt. Much of this is personal preference. 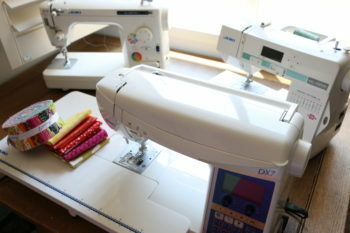 I use Aurifil 50wt cotton thread for both piecing and quilting. There are lots of great options, but the thing to consider is making sure you have a high quality, low lint thread AND that is matches your needle size. Beyond that, experiment and see what you prefer! A scant 1/4 inch seam means that it’s a few threads smaller than a full 1/4 inch seam. What is this important??? I know it seems a little strange but using a scant 1/4 inch makes your quilt blocks come out the right size. 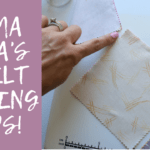 You want to keep your seam consistent throughout your project, but I remember first learning to quilt and being so frustrated that my blocks were turning out smaller than the pattern I was following. That was before I know about this scant 1/4 business. Just trust me, its a good habit to be in and widely accepted across the quilting community as a best practice. Tip #5 Prewash or Don’t! Speaking of Precuts, many of them come with a zig zag or pinked edge. When you cut these, include that zig zag in your measurement so measure from the outside of the zig zag not the inside. A lot of people get confused and aren’t sure about how to do that! Don’t forget to change that rotary blade now and then. I know they are a little expensive, but when you have to push down really hard you can slip and hurt yourself and/or mess up your cutting. Along with that is to make sure you are looking for that 90 degree angle when you cut ;). I will link a video I have on cutting that goes over it in more details HERE! 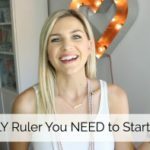 When you line up that ruler onto your fabric, make sure the line of the measurement you are using is on top of your fabric, included into the cut rather than on the outside of the fabric. This gives you a few threads extra wiggle room rather than a few threads too small. 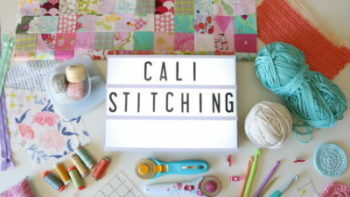 It’s a good habit and best practice to include in your quilting techniques! Make sure you are regularly cleaning out the lint from your machine, oiling it if your machine requires it and taking it to the sewing/vac shop for regular maintenance. If you buy a used or vintage machine I recommend that you have it serviced right away since you don’t know how it was cared for. This will save you some potentially very frustrating situations where your machine acts up! Newsflash! Your first several quilts won’t be perfect. There will be things along the way we wish we did better or differently when it comes to our quilting, but don’t let that get you stuck. Put the seam ripper away ;). Don’t let these small errors that only you will notice frustrate you and keep you from enjoying the process and having fun! *This post contains affiliate links. They are of no extra cost to you and allow you to find the things I mention quickly. THANK YOU for the amazing support in this way. 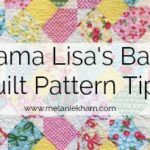 Mama Lisa’s Baby Quilt Pattern Tips! Just wanted to let you know how much I enjoy your videos they’re so easy to follow. Thank you..
Love your newsletters and all the tips. a Church fundraiser in November. Think they will sell. Thank you for you videos on quilting. I enjoy them and learn alot from you! Does the scant 1/4 inch foot you have listed above work with the juki 2010? Thank you so much! Love you! I watched your video, how to make a bench cushion and it was perfect, learning lots from you. All of these are great things to know about most of us newbies don’t know what or how on lots of things .